So you installed GIMP on your computer, congratulations! 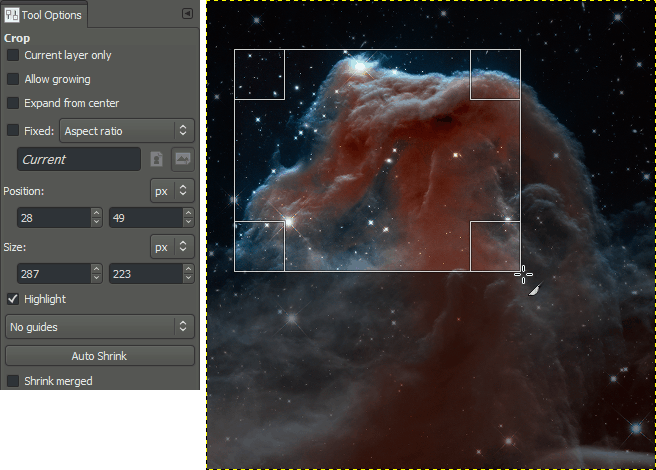 GIMP is a very powerful image manipulation software, but don’t let that intimidate you. Even if you don’t have time to learn advanced computer graphics, GIMP can still be a very useful and handy tool for quick image modifications. It is my hope that these few examples will help to solve those small, quick modifications that you may need to apply to an image. Hopefully this will lead to learning even more powerful image editing capabilities that GIMP is capable of as well. In keeping with the spirit of the predecessor to this page, I will be using images from the Astronomy Picture of the Day (APOD), provided by NASA. It’s a common problem that you may have an image that is too large for a particular purpose (embedding in a webpage, posting somewhere online, or including in an email for instance). In this case you will often want to scale the image down to a smaller size more suitable for your use. This is a very simple task to accomplish in GIMP easily. 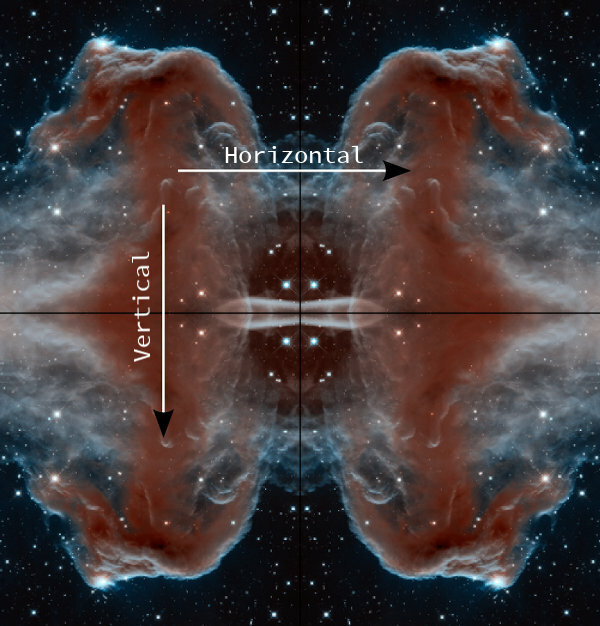 The image we’ll be using to illustrate this with is The Horsehead Nebula in Infrared. 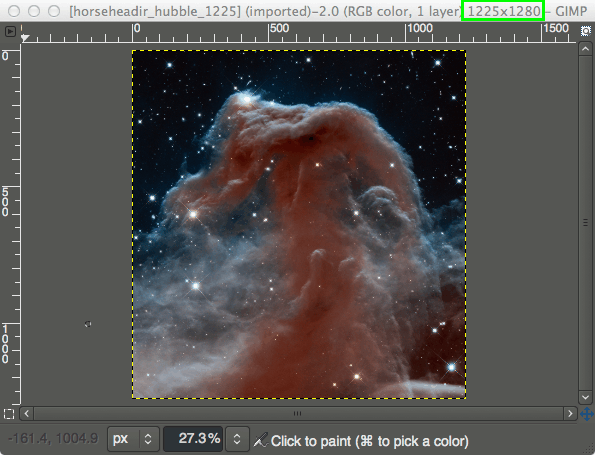 When you first open your image in GIMP, chances are that the image will be zoomed so that the entire image fits in your canvas. 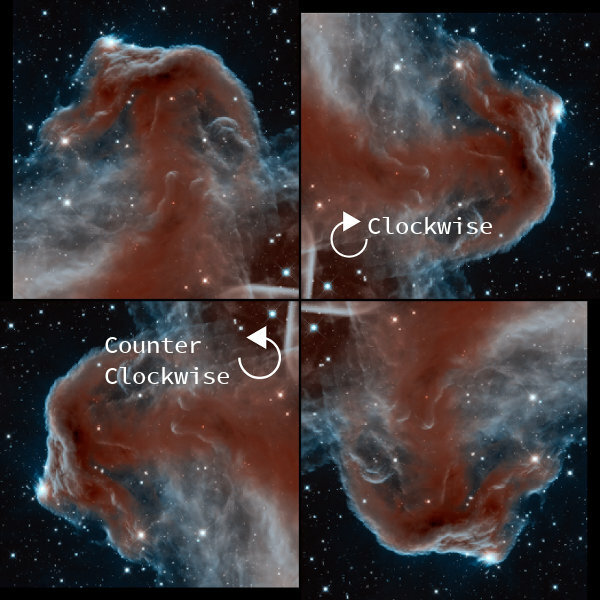 The thing to notice for this example is that by default the window decoration at the top of GIMP will show you some information about the image. View of the GIMP canvas, with information at the top of the window. Notice that the information at the top of the window shows the current pixel dimensions of the image (in this case, the pixel size is 1225×1280). 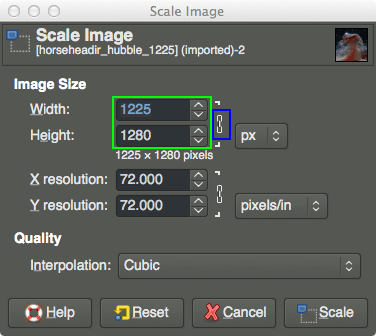 In the Scale Image dialog, you’ll find a place to enter new values for Width and Height. If you know one of the new dimensions you’d like for the image, fill in the appropriate one here. You’ll also notice a small chain just to the right of the Width and Height entry boxes. This icon shows that the Width and Height values are locked with respect to each other, meaning that changing one value will cause the other to change in order to keep the same aspect ratio (no strange compression or stretching in the image). Changing the Width to 600px. As you can see, entering 600px for the width automatically changes the height to 627px. Also notice I have shown a different option under Quality → Interpolation. The default value for this is Cubic, but to retain the best quality it would better to use Sinc (Lanczos3). A common use for this could be if you wanted to specify a new size as a percentage of the old one. 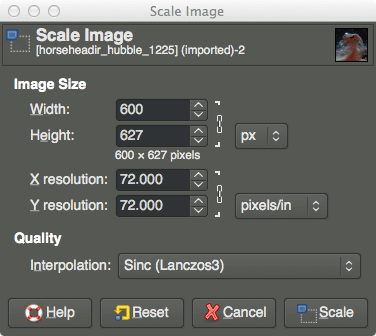 In this case you could change to “percent”, and then enter 50 in either field to scale the image in half. to overwrite the original file (use caution). 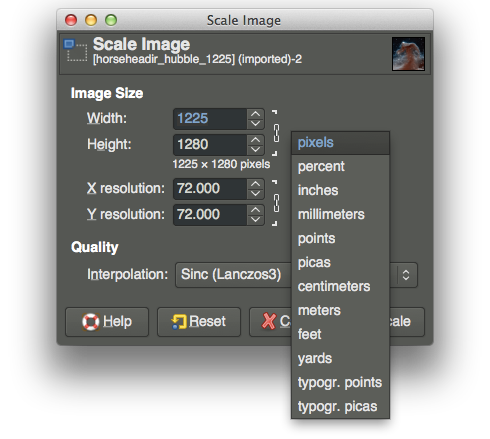 For more detail about using Scale Image, you can see the documentation. 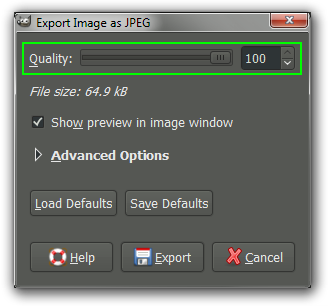 You can also modify the filesize of an image when exporting it to a format like JPEG. JPEG is a lossy compression algorithm, meaning that when saving images to the JPEG format, you will sacrifice some image quality to gain a smaller filesize. 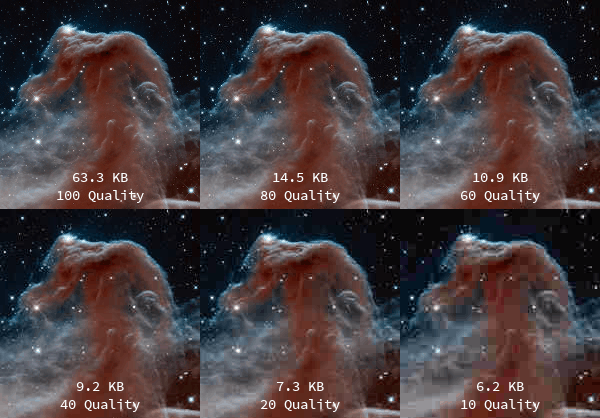 Comparison of different JPEG compression levels. As you can see, even at a quality setting of 80, the image is significantly smaller in filesize (77% size reduction), while the image quality is still quite reasonable. You can now enter a new name for your file here. If you include the filetype extension (in this case, .jpg), GIMP will automatically try to export in that file format for you. Here I am exporting the image as a JPEG file. You can also navigate to a new location on your computer through the Places pane, if you need to export the file to a different location. When you are ready to export the image, just hit the Export button. From this dialog you can now change the quality of the export. If you also have the “Show preview in image window” option checked, the image on the canvas will update to reflect the quality value you input. This will also enable the “File size:” information to tell you what the resulting file size will be. (You may need to move some windows around to view the preview on the canvas in the background). When you are happy with the results, hit the Export button to export. 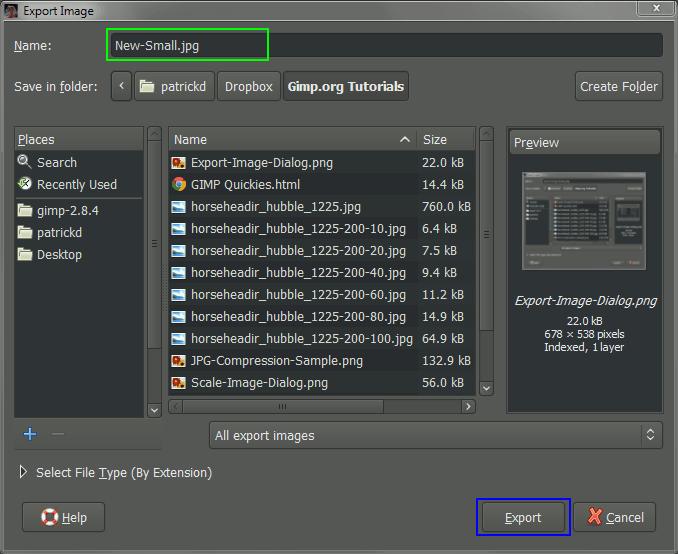 To see more details about exporting different image formats, see Getting Images out of GIMP in the manual. There are numerous reasons you may want to crop an image. You may want to remove useless borders or information for aesthetic reasons, or you may want the focus of the final image to be of some particular detail for instance. 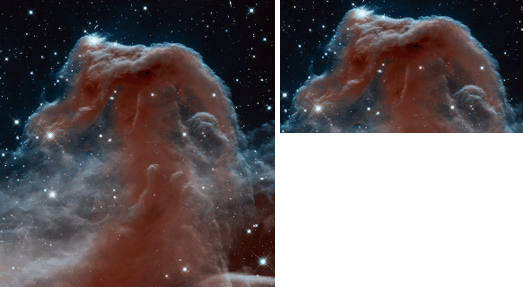 Original image (left), cropped image (right). Crop Tool on the Tools Palette. Once the tool is activated, you’ll notice that your mouse cursor on the canvas will change to indicate the Crop Tool is being used. Now you can Left-Click anywhere on your image canvas, and drag the mouse to a new location to highlight an initial selection to crop. You don’t have to worry about being exact at this point, as you will be able to modify the final selection before actually cropping. Initial pass with the Crop Tool. Crop Tool options (left), cropping on the canvas (right). After making the initial selection of a region to crop, you’ll find the selection still active. At this point hovering your mouse cursor over any of the four corners or sides of the selection will change the mouse cursor, and highlight that region. This allows you to now fine-tune the selection for cropping. You can click and drag any side or corner to move that portion of the selection. Once you are happy with the region to crop, you can just press the “Enter” key on your keyboard to commit the crop. If at any time you’d like to start over or decide not to crop at all, you can press the “Esc” key on your keyboard to back out of the operation. See the documentation for more information on cropping in GIMP. There may be a time that you would need to rotate an image. For instance, you may have taken the image with your camera in a vertical orientation, and for some reason it wasn’t detected by GIMP as needing to be rotated (GIMP will normally figure this out for you, but not always). All flips applied to base image (top left). Image rotation from the Transform menu is contrained to either 90° clockwise/counter-clockwise, or 180°. 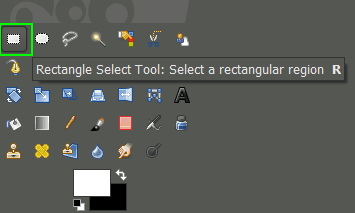 Don’t mis-interpret this to mean that GIMP cannot do arbitrary rotations (any angle). Arbitrary rotations are handled on a per-layer basis, while the image rotation described here is applicable to the entire image at once. The simple examples shown here are just the tip of a really, really large iceberg. These are, however, common modifications that many people are often looking to make without having to learn too much about image processing. Hopefully they have been helpful. I encourage you to peruse the other tutorials for more advanced methods of image processing as well! The original tutorial this was adapted from can be found here.